Special edition of the Chung Shi Power, ca. 30% lighter and smaller than the corresponding model for men. 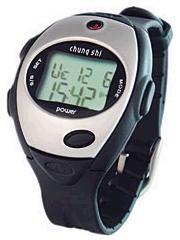 The Chung Shi XS Power Heart Rate Monitor in an appealing design with a stainless steel frame is the ideal training unit to improve physical endurance for the target group that demands a little more. In addition to the functions of the Chung Shi Coach the Chung Shi XS Power offers the display of calorie expenditure and a backlight. TheChung Shi XS Power Woman Heart Rate Monitor comes standard with a chest strap.